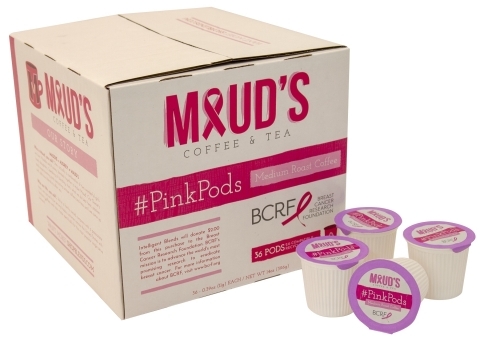 SAN DIEGO–(BUSINESS WIRE)–Intelligent Blends, a leading single-serve coffee and beverage company, has launched a year-long “coffee with a cause” campaign with the introduction of #PinkPods, a new variety in the Maud’s Coffee & Tea’s line, in partnership with the Breast Cancer Research Foundation (BCRF). #PinkPods, which are eco-friendly and 100 percent recyclable, are now available for purchase on the company’s ecommerce website, www.ShopBlends.com, along with Intelligent Blends’ other brands, including Intelligent Blends’ namesake line and premium small-batch line, Roastmaster Reserve. The #PinkPods campaign invites consumers to visit www.ShopBlends.com and participate in a social media campaign using the hashtag #PinkPods throughout the month of October and beyond. Intelligent Blends is a coffee manufacturing company dedicated to making single serve cups available to brands and suppliers of all sizes. With a dedicated 60,000 square foot state-of-the-art facility in Southern California, a veteran management team including a fifth generation Roast Master, and top-of-the-line equipment, Intelligent Blends services one of the fastest growing markets in retail and online. With a current capacity of over 200 million single serve cups per year, Intelligent Blends has one of the largest co-packing facilities in the U.S. Intelligent Blends has been making premier beverages for the popular Keurig and Keurig 2.0 brewers since 2013 and has a unique distribution model in which the freshest pods are delivered directly to consumers through its ecommerce site, ShopBlends.com, as well as at select retailers and in 50,000 hotel rooms across the country. The Breast Cancer Research Foundation (BCRF) is dedicated to being the end of breast cancer by advancing the world’s most promising research. Founded by Evelyn H. Lauder in 1993, BCRF-funded investigators have been deeply involved in every major breakthrough in breast cancer prevention, diagnosis, treatment and survivorship. BCRF is the largest private funder of breast cancer research worldwide and the highest rated breast cancer organization in the U.S. Visit bcrf.org to learn more. Happy Holidays From Intelligent Blends!